In the world of microservices and container technologies, we need Java applications to start as standalone units rather than within heavy application servers. This post will show how to embed the Jetty Server within a Java application. It will load a war file that is part of the project and that lives as a maven sub-module. 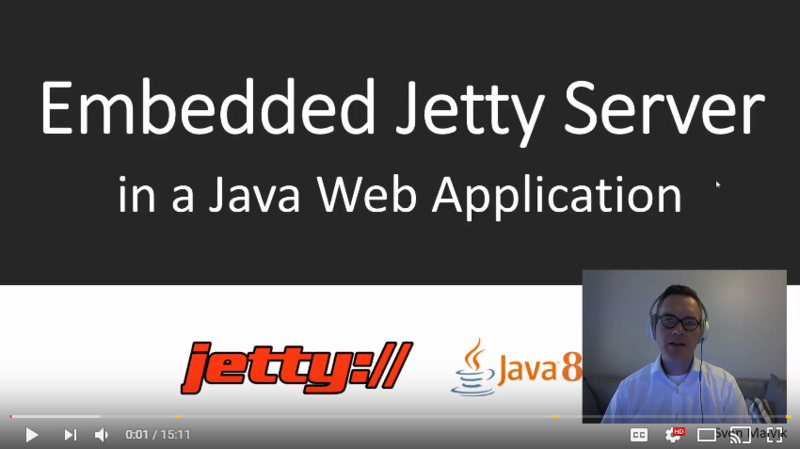 The following tutorial is a more of a transcript of my video “Embedding Jetty Server in 15 minutes.”. Create a maven module for the server. Create a maven module for the web application that build the war file. Add webapp (.war) support into the server module. The first job you’ve to do is to open your IDE and create a new maven project. In my case I’m going for maven 3.3.9. When done you might notice a source (src) folder that you can delete since we’re going for a multi module project. You don’t need to modify the root pom.xml yet. The next step is to open the generated App.java file. That’s the file where the main method is located. In here we’re going to implement the Jetty server startup. You’ll find the .war file under webapp/target/webapp.war. Add webapp (.war) support into the server modul. Navigate now to your App.java file and replace setServlet(server) with setWebappServlet(server);. That was all you needed to do. Start the server from your IDE and browse to http://localhost:8080/web.